Category 6 Pre-terminated Trunk Assemblies help to reduce significantly both time and cost of a category 6 ca-bling installation. Terminated and tested in a controlled manufacturing environment, cut to the customer pre-ordered lengths, and ready to install in a patch panel, trunk assemblies eliminate all these operations in the field making your job easy and efficient. 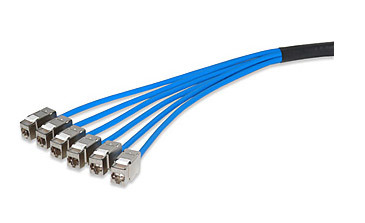 Trunk cable assemblies can be provided in an unscreened (U/UTP) and screened (F/UTP) versions in either in a jack-to-jack, jack-to-plug, or jack-to-blunt cut configurations to support the widest range of applications. Cables can be used with any field-configurable patch panel (screened assemblies are not compatible with 48U-HDMMP-1R panels only).